The Outer Hebrides, also known as the Western Isles (islands of the strangers) have a bedrock formed from ancient metamorphic rocks and the climate is mild and oceanic. There are various important prehistoric structures, many of which pre-date the first written references to the islands by Roman and Greek authors. 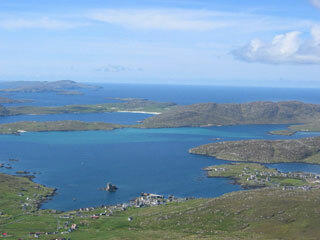 Much of the land is now under local control and commercial activity is based on tourism, crofting, fishing, and weaving. This article uses material from the Wikipedia article "Outer Hebrides Islands", which is released under the Creative Commons Attribution-Share-Alike 3.0 License.